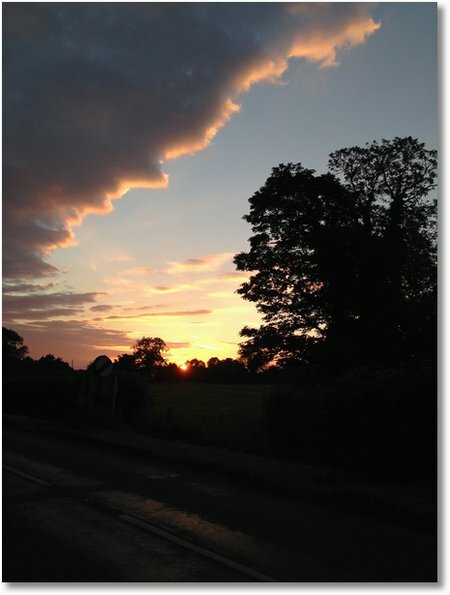 This was the view from home on June 21st 2014 at 21.25,just as the sun disappeared over the horizon. The longest day was coming to an end and it wasn’t over yet as the daylight and twilight continued until well past 22.00. What an amazing experience and wonderful to have so much sunshine on the longest day. Most of the information available relates to the Summer Solstice and to the druids at Stonehenge, rather as if they were and still are the only ones who find this a special time. Solstice’ literally means the stopping or standing still of the sun. It is used as a name for the longest day of the year – 21 June – when the sun is at its highest point in the northern hemisphere. The sun reaches its highest position in the sky twice a year as seen from the north or south pole. This is when either hemisphere is tipped towards the sun more than on any other day of the year. The day of the solstice has the longest period of sunlight in the calendar year (16 hours and 38 minutes in London). The only exception is in polar regions, where daylight can last for days or months. Light is powerful, and that our relationship with our star, the sun, is crucial to our planet. Being filled with light gives us hope and joy and a real lift to our souls. This entry was posted in church seasons, pastoral, theological and tagged church of england, wikipedia. Bookmark the permalink.